We will be having the last Venus transit of our lifetime this year and it will take 4 generations ( each generation is 30 years) to see it happen again! 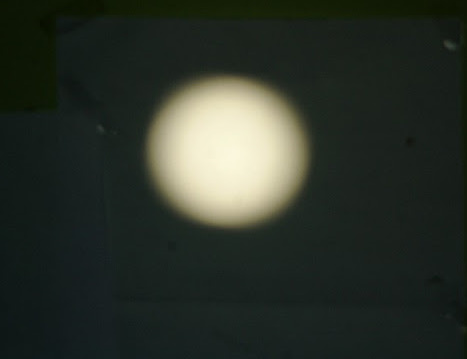 So, in order to bring the viewing to all at lowest cost, I experimented with some common available reflective objects like plain mirrors, plain mirror projected light through 90 mm magnifying glass, convex mirror, concave mirror, projection via convex and concave lenses! I also did experimenting with flat front coated mirror and a VLFL of 4 inch dia and 10 metre focus! A Small note on the Transit of Venus! 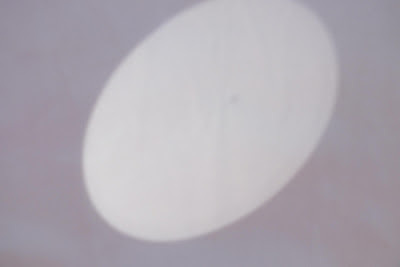 The next transit of Venus will occur on June 5–June 6 in 2012, succeeding the previous transit on June 8, 2004. After 2012, the next transits of Venus will be in December 2117 and December 2125. Last one occurred on 2004. In 1874 it was calculated and observed purely by mathematics and using simple techniques as I have elaborated here by Pathani Samanta Chandrasekhar also known as The Naked Eye Astronomer /Astrologer who's details can be found here! A transit of Venus across the Sun takes place when the planet Venus passes directly between the Sun and Earth, becoming visible against (and hence obscuring a small portion of) the solar disk. During a transit, Venus can be seen from Earth as a small black disk moving across the face of the Sun. The duration of such transits is usually measured in hours (the transit of 2004 lasted six hours). A transit is similar to a solar eclipse by the Moon. While the diameter of Venus is almost four times that of the Moon, Venus appears smaller, and travels more slowly across the face of the Sun, because it is much farther away from Earth. Observations of transits of Venus helped scientists use the principle of parallax to calculate the distance between the Sun and the Earth. Transits of Venus are among the rarest of predictable astronomical phenomena. They occur in a pattern that repeats every 243 years, with pairs of transits eight years apart separated by long gaps of 121.5 years and 105.5 years. The periodicity is a reflection of the fact that the orbital periods of Earth and Venus are close to 8:13 and 243:395 resonances. Before 2004, the last pair of transits were in December 1874 and December 1882. The first of a pair of transits of Venus in the beginning of the 21st century took place on 8 June 2004 and the next will be on 6 June 2012. After 2012, subsequent transits of Venus will be in December 2117 and December 2125. Flat front coated mirror with 30’ FL! Other projection technique like cone projection which is using large funnel or cone with a covering of tracing paper or a cinema screen! Ball of 6 inch dia: Rs. 10! Cone projection I am not elaborating now as it is deeply known to many! The construction of the ball projection is simple and easy. This method might have been known to many astronomers or they claim to know but sadly only few really attempt or experiment on such simple methods or tell others to experiment on such easy to use ones! Since, I don’t have access to good solar telescopes or filters as what is available here is not of good or great quality as they are Chinese made and filters just fade out after 3 months of use! So, I was scratching my head on finding an easy way to see the spots and also to see the happening of transit! 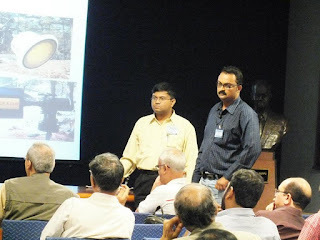 In Indian Institute of Astrophysics workshop on day time astronomy I was discussing various ideas with fellow amateur and professional astronomers and there I got a spark of idea from Navnirmiti a Poona / Kolapur based Indian astronomy group whom had placed a ball projection with a front coated mirror as an idea. They are into spreading of ancient Indian astronomy using simple aids! I just improvised that idea by using convex mirrors as it is easy to procure and almost every school will have one! Coming to our story, as flat coated and VLFL lens are bit costly and many will hesitate to buy also, there is a possibility of makers insisting only bulk supply, I wanted to use simple available alternatives. I wanted to test convex and concave mirrors and lenses! Hence, I bought 2 one metre and 10 Cms FL concave and convex mirrors and lenses. On my experimentations with candles which usually did in Physics labs, to ascertain the image quality and to get an idea of actual FL of the mirrors! I found that FL of concave mirror is about 1 to 2 times the actual marked FL. My 10 cms FL concave mirror had clear image at 20 cms! While 1 Metre FL produced good but small image at 2 metres! I am not going into formula as I never understood formula or maths! I just settle for practical and trial & error methods! 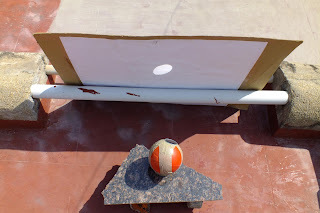 This is by far the simplest method to project the Sun's image, which works because the sunlight’s intensity is so strong it outshines everything. This experiment can be done in any room which has a window or door opening outside, and which can be sufficiently darkened by putting dark cloth over the places from where light enters the room. Complete darkness is not necessary. Just how much darkness is needed you can discover for yourself by trial and error. However, the darker the room the better the results. If not use a white chart sheet glued to a cardboard or to a wall! I would suggest use of a large carton with one side flaps removed and a 6 – 7 inch dia hole created on one side as a window to see and photograph the casted image and a large square sheet of chart paper glued on the inside wall/flap of the carton as a screen! This contraption will be your dark room or projection studio! But in these carton and chart projection, willy nilly one has to project when the sun is shining and sharpness and contract will be low due to outshining sun light as in the image attached i.e for projection outside in a open area! You can make a powerful sun telescope at very low cost with a plastic ball and mirror. The ball provides a sensitive but steady mount. As in any good telescope the mount is as important as the optics. 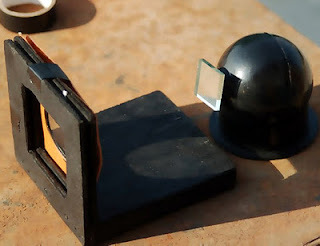 The optics is provided by the pocket mirror / Concave or front coated mirror, if you don't have a hollow plastic ball, a watermelon or a pumpkin or a soccer ball can also provide a good mount. Just improvise! 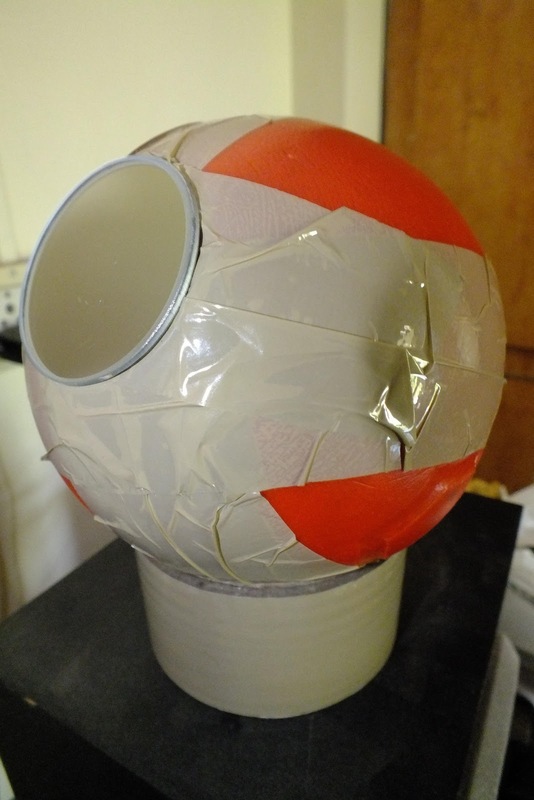 Make a small hole in the plastic ball and fill the hollow with sand as fully as possible. Seal the hole with tape. 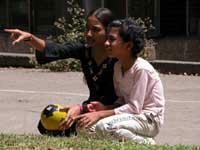 If using fruits or playing ball just glue to the object! Now cover the mirror with an opaque paper screen except for a circular disc of diameter 2 cm at its centre. Your optics is ready. Fix the mirror on the ball with adhesive tape. 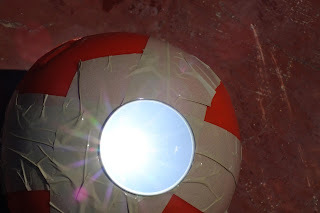 I just glued to the ball and didn’t cover as covering a convex will affect the image projected. A cylindrical ring or a packing tape spool forms the base for the ball and mirror. The ball can be set at any angle in its base. The sand inside adds to its weight and makes it stable. Your solar telescope is now ready for use. VLFL placed in front of the ball projector. 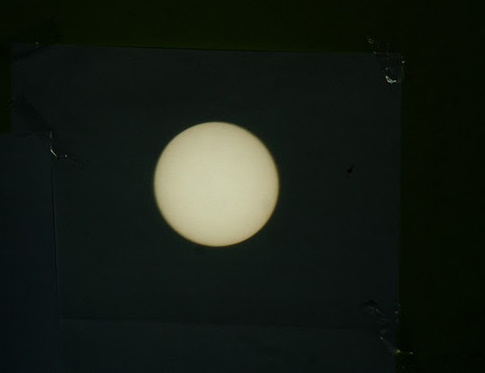 Image of the sun with Ball projector placed at 10 meters from the wall, without any aperture or lens. Place the ball and mirror on a stool outside the room in the sunshine. Adjust the angle of the mirror so that it projects the sun into the darkroom on a white screen. Increase the distance of the mirror from the screen to around 30-40 metres. 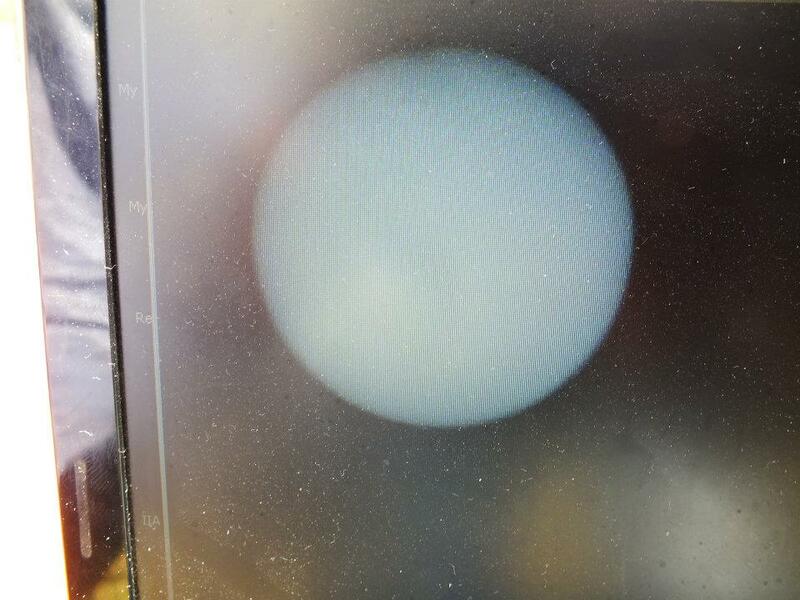 At this distance you will get a nice big image of the sun around 35 cm in diameter. Believe it or not, but with this simple projector you can actually see sunspots and some dark filaments on the sun. There are two ways to improve the resolution of the image. The first is to adjust the distance between the projector and the screen till you get the sharpest image of the sunspots. The second is to improve the image far sharper and better we need to use a VLFL convex lens just on the FL and adjust the mirror and lens to get a clear image! (Further refinement can be obtained by using elliptical apertures on the mirror depending on the sun's position in the sky. But this is only for the perfectionists). For best results use trial and error, this always works better than theory. Practice now till May end and you will be ready for the 6th of June 2012. A point to note: to get round image the screen to be exactly opposite the mirror and sun to be diagonally on the other side left or right. Experimentations will make one to have better ideas! 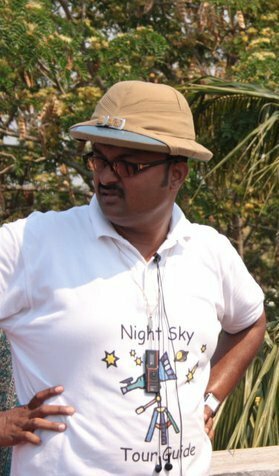 This amazing little optical device is really a powerful telescope with which one can get sun images as large as one wishes, limited only by the size of your dark room and size of the lens or mirror. For very large image (one meter diameter, and even larger depending upon the size of the mirror) you will have to also increase the size of the mirror aperture. Use trial and error for best results. 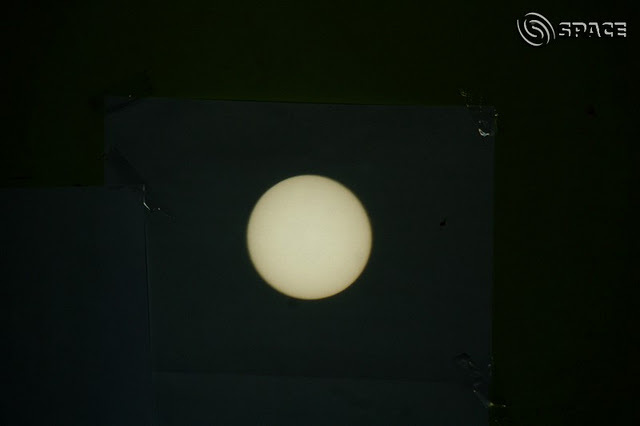 4. we need to adjust the mirror and lens and screen depending on sun's position, so improvise by trial and error! 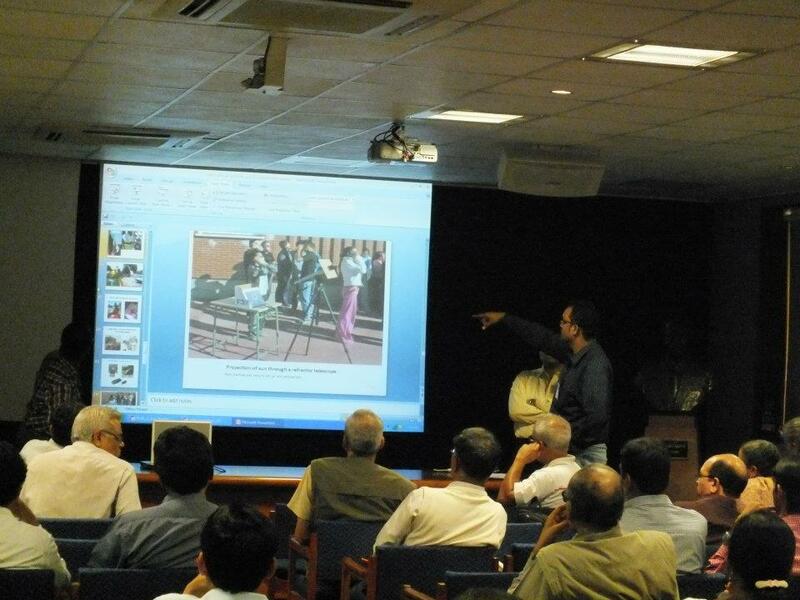 This image below is based on the idea suggested by balaji is not tested on ground by me but good on theory: I am discussing through him with some PhD research scholars of Indian Institute of Technology, Madras to get better and big image on a short distance. Hope for best! 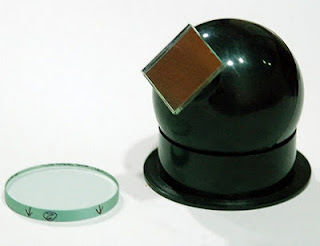 If using flat front coated mirror: Place the ball with mirror on a holder which is your tripod! Place the VLFL on its front diagonally and adjust both to get a good image! On VLFL: It is commonly believed that a convex lens concentrates the light from the Sun. This however is true only if the focal length is small. 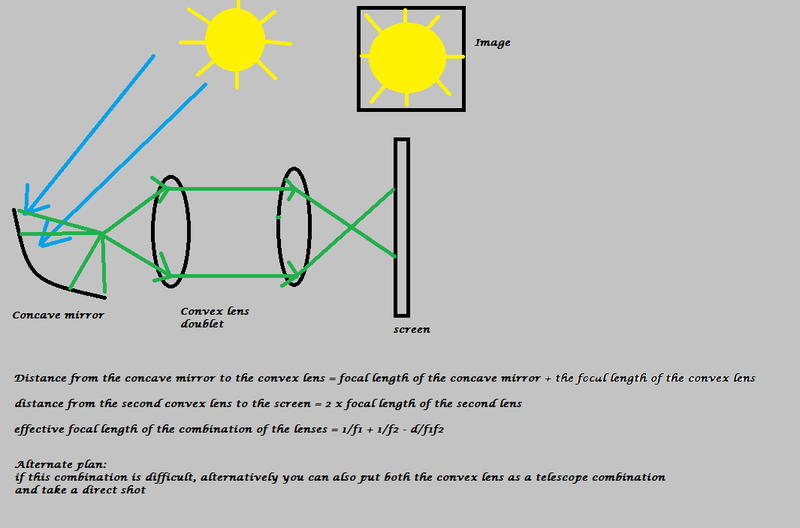 As the focal length of the lens increases the size of the Sun's image increases. The relation is the same as for a pinhole projector. Image diameter = focal length of lens / 110. For a very long focal length (VLFL), the diameter of the Sun's image can be quite large, larger than the lens itself. VLFL lenses with focal length of 4 metres and ten metres. The second lens gives a large image of the sun more than 9 cm in diameter. 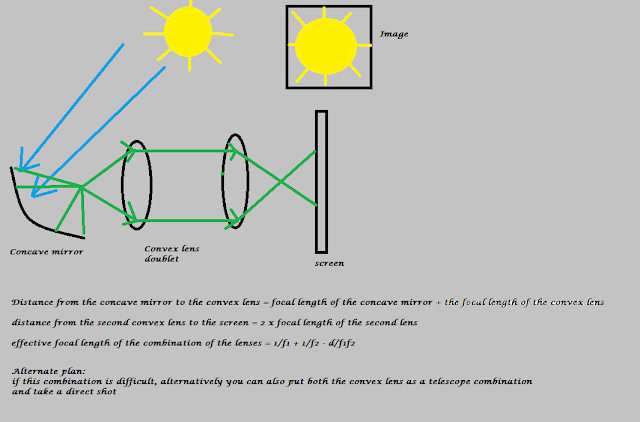 For a 90 mm diameter lens with a focal length of 10 metres, the image of the Sun will be larger than the lens itself, showing that a convex lens doesn't necessarily concentrate light. 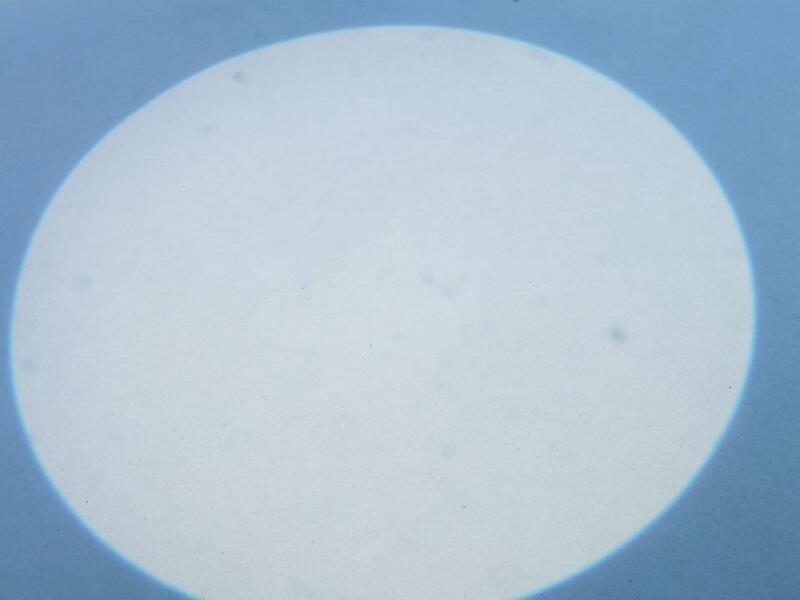 Using a VLFL convex lens, fixed within a cardboard shade with a hole cut in the centre, you can get a nice big image of the Sun on which sunspots & filaments are clearly visible, if the lens is of good quality. There is another way to see the sun but this for those with a laptop: Take a small tube say 10 – 12 cms long not more than that! On one end place a short focal length lens and ensure it is covered with a solar film as seen in eclipse goggles! Image as seen in the laptop! Cover lens with that film and place it on one of the tube’s end and on the other end connect a cheap webcam or a CCTV cam! Remove all those coverings before inserting the cam into other open end and secure the cam with tapes and ensure the cam end is totally covered not to let an iota of light to enter inside the tube. Light’s only entry is through the filtered lens. Place it on a small tripod and connect to your laptop or PC, position it on the sun! If the chip is small then I am sure the image will be there for 10 mins atleast and if moves adjust slightly to get centre of the lens. One can see the spots, transiting planets and ISS and record the image! But one cannot see the prominences etc! Currently the front coated mirrors are being made by my friend Mr. Chander Devgan. I have used some of his images here with permission. Good luck for you all on successful outcome on experimenting with these ideas! Also, good viewing during Venus eclipse. Here I am afraid the section might be lost due to advancement of south westerly monsoon as upto latitude 16 deg monsoon would have covered on that date and it would be overcast here at this latitude as monsoon usually settles over my city around June 6th with 6 days either side as probable dates of ingress!